Since joining the Community Foundation of North Louisiana, I am often asked, “What is the Community Foundation?” Simply, it is a permanent endowment for the community. Community foundations by design are flexible and able to respond to the ever-changing needs of their communities. As stewards of an endowment established by generations of generous donors, we take our role very seriously in studying the needs of our community so we may meet those needs most efficiently and effectively. Established in 1961, the Community Foundation oversees $135 million in assets, and our mission is to promote philanthropy and improve the quality of life in North Louisiana. In 2017, the foundation granted $6.4 million to local nonprofit organizations to benefit the community. In our quest to address community needs and effect positive change, data guides us in all that we do. Accurate data is essential to help us set priorities, track progress and allocate resources. Observing trends over time demonstrates where our community is making progress versus areas that need more attention. In 2008, the Community Foundation began publishing Community Counts to provide the data we gather to all in the community. The authors of Community Counts are Dr. Dave N. Norris, chief research and innovation officer at Louisiana Tech University, and Dr. Amanda M. Norris, a psychologist in private practice in Monroe, La. Data for the Shreveport-Bossier Metropolitan Statistical Area, or MSA, is collected in six categories – population, economic well-being, human capital, health, social environment and physical environment – then compared to 10 communities of similar size in neighboring states. These MSAs are defined by the U.S. Census Bureau, and ours includes measures from Bossier, Caddo, DeSoto and Webster parishes. 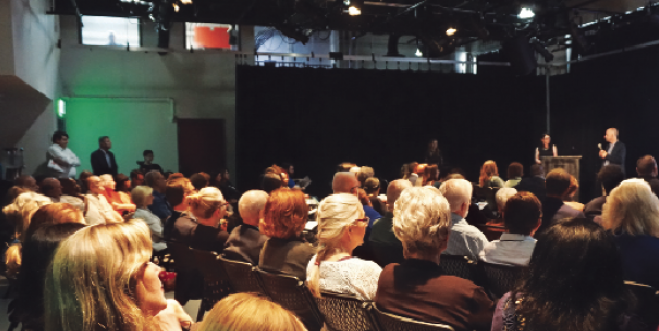 On Oct. 11, 2018, the Community Foundation presented the 2018 edition of Community Counts data to more than 120 members of the community. The presentation revealed both positive and negative trends. Specifically, while there has been progress in areas like education, it is clear that poverty – particularly among families with small children – is persistently growing. Statistically, the best way to stop the cycle of poverty is to ensure the educational success of children from the time they are born to the time they enter the workforce. Positive Trends. Shreveport-Bossier saw some positive trends from 2015 to 2016 including an increase in 3- and 4-year-olds enrolled in school from 39.8 percent in 2015 to 49.7 percent in 2016 (improving the MSA’s peer ranking from ninth to third). Enrolling 3- and 4-year-olds in preschool programs better prepares them for kindergarten. Kindergarten readiness is statistically linked to third-grade reading proficiency, which is statistically linked to high school graduation. Thus, preparing a child to enter school can help to ensure they graduate from high school and find a living wage job. Shreveport-Bossier moved up from eighth place to sixth place in the share of the population with associate’s degrees and improved from tenth to eighth among its peers relative to the percentage of the population with a bachelor’s degree or higher. Finally, there was a 27 percent increase in the high school graduation rate from 2008 to 2016. Community Needs. The negative trends identified highlight the most pressing community needs. In 2014 Shreveport- Bossier had the third highest share of 16- to 19-year-olds not enrolled in school, not in the labor force and unemployed (12.1 percent). In 2015 that number rose alarmingly to 14.9 percent, the highest among its peers. In 2016 that figure fell to 8.3 percent. While the second highest among the peer communities, this was a dramatic improvement. It is imperative we continue to monitor this indicator, which is a critical measure of how well the education system, business sector and community are engaging and preparing young people for success. Poverty is linked with substandard housing, homelessness, inadequate nutrition, food insecurity, inadequate child care, lack of access to health care, unsafe neighborhoods and under-resourced schools. The effects of poverty on children are particularly dire. More than one out of three Shreveport- Bossier families with children under 5 were living in poverty in 2016. Children in poverty are statistically at greater risk of poor academic performance, dropout and developmental delays. In adulthood, this can result in lower overall educational attainment, earnings and health. Few things would make a more significant impact on the long-term prosperity of Shreveport-Bossier than a successful anti-poverty effort aimed at children. While we have seen improvements, the majority of adults in poverty lack a college education and a sustained connection to the labor market. Combining high school, postsecondary and higher education attainment measures demonstrate 70.8 percent of adults in Shreveport-Bossier have something less than a post-secondary degree. Educational attainment statistically affects earnings. Of people working full-time or part-time in Shreveport-Bossier, 31.7 percent still live below the poverty line. Access to quality education and a living wage job is critical to decreasing poverty. Communities with high rates of poverty are likely also to have relatively poor health outcomes. Relative to its peers, Shreveport- Bossier has the highest rates of low-weight births and teen births. Access to quality maternal and health care is critical and must be a high priority. The direct costs and loss of economic productivity resulting from poor health indicators are costly community problems we cannot afford. While poverty is a very complex issue, it can be attacked through comprehensive and data-driven action. Ensuring the success of our children in poverty will take a publicprivate partnership as no one entity or agency can solve these issues alone. At the Community Foundation, we invite and encourage all to work together to make Shreveport-Bossier a long-term success. View the full report and all data at cfnla.org/data.